The Journal is published by the Society for Policy Modeling as a forum for analysis and debate on policy issues. The Journal focuses upon the economic, social and political developments that now shape the world economy and the policies needed to improve them. The Journal emphasizes formal modeling techniques serving the purposes of decision making. Such a focus requires, in the first place, the highest academic standards, adherence to the state-of-the-art in the field, and the ability to critique prevailing conceptual methods. The proposed analytical instruments must be empirically validated on the basis of replicable data, and take into account the interdependence of economic trends over-time, countries and sectors. A second, key element in the evaluation of a submitted article is whether the proposed model can be of use for policy purposes and what policy-makers can learn from it. Editors discourage submission of papers exclusively focused on techniques, without answering the question: "what can public policy make out of the conclusions reached by the proposed model?" Historical and thematic reviews of modeling are welcomed. 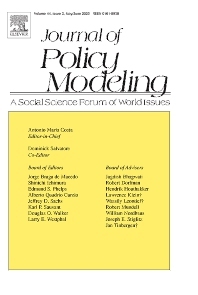 The Journal of Policy Modeling is published bimonthly by Elsevier Inc. It is supported by a special purpose, on-line depository of scientific papers, EconModels.com. By fostering an interactive exchange views about fully refereed papers, EconModels.com helps authors to adapt to digital life, gain broad recognition, generate debate, and share information with peers hard to reach otherwise. A Board decision whether to publish a given paper in the Journal of Policy Modeling or in EconModel.com reflects mostly logistical considerations (length, space, relevance, timing, queue). The scientific merits of research must be outstanding in either case.